I reported some difficulty in accessing John Belcher's UKMAMS Association website last week. It transpires that some functions on the lead page are not compatible to users of Netscape browsers, and a "404 Error" will pop up. John promises that he will fix this as soon as possible. In the meantime I did manage to look at the pages using Internet Explorer, and his latest efforts are noteworthy. New members this week are David Blore from London, Charlie Cormack from Swindon, Jon Kerswill from Cricklade and David Austin from Leicester. Welcome to the OBA! A few additions are in the Images pages courtesy of Taff James in Bruggen and Alan Warwick-Moore in Southampton. Firstly, Taff sent us a picture taken in Belize of himself with an old aircraft prop reflecting about 150 names of people who served there. He doesn't know what happened to the prop, but thinks it might have ended up at the Movements School at Brize Norton. Alan sent in a couple of pictures showing gatherings at the Brit Club in Limassol in nineteen seventy something. He did remember a few people, but please do have a look and see if you can put some names to faces. You asked in the last newsletter if the Dave Wall Trophy was linked to a Dave Wall you knew at Brize in the early 70's. I don't know Dave's tour dates but I suspect he's the same. He originated from Chesterfield but I don't know when he enlisted. However, he did a tour in the early 70's on Mobility at Marham along with John Boyd. He also did a tour in Malta. I first met Dave at the RAF Movs School in 1982 when we were both instructors. He was promoted to FSgt in 1984 and joined the Movs Sqn at Brize. Later in the early 90's he was posted to Akrotiri as a WO. In April 1995 whilst stationed in Gibraltar Dave had a fatal heart attack whilst walking back across the border from Spain, he was aged just 50. His body was flown back to UK and over 150 movers past and present attended his funeral in Chesterfield along with his widow, Barbara. She eventually relocated to Spain. Dave was well liked throughout the trade for his genuine friendly attitude and wicked sense of humour. It was as a result of his reputation that the annual Movements Golf Competition became known as the Dave Wall Trophy. Hope this answers your question. If you need any more info please ask. Regarding the Oil Lift photographs - The Sgt in the picture is Jim Guthrie. As regards loading the barrels sideways, we could get 102 barrels on that way plus they were all empties and Caledonian had only had lashing equipment that they had "borrowed" from a Hastings I believe. The floors were not stressed and all they had done was remove the seats and put some wood down to protect the carpets. The site looks great! Ian Berry really loves the oggies, hence my comment in the Guestbook! Ian Stacey was a bit out in his dates as the Oil Lift packed up in November 1966, and the civvies had finished in the July of that year, that's what age does for you! I don't know if MAMS still have copies of "Moving in Mysterious Ways" which was published by Cover 2 Cover in Kettering, Northants, and has loads of stories. John Belcher could find out as it was published circa 1992, and is the history of UKMAMS from 1966 to 1991. You might receive a few mysterious e-mails! Our latest edition of The Britannia Association magazine is just out and I have featured that photo you sent me of the band marching away from a Britannia. In connection with it, I have mentioned the UKMAMS Old Boys Association and the website address. If you wish to see a copy then it is on-line: http://www.keyhambooks.freeserve.co.uk/ke00009b.htm . Wisdom comes in 10 parts, 9 of which are silence. The tenth is brevity of language. (Old Scottish proverb). 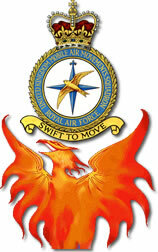 The RAF News is now on line at http://www.rafnews.co.uk and will be published every fortnight. The lastest issue is due today, March 2nd. I can perhaps help with the Advanced Movements class photo. The person at the back left appears to be Sean Blythe who now lives in Darlington and the officer at the front is Gordon Spiers. Gordon handed over to Bill Jacobs in 64/65 just before the Squadron was formed. The officers when I joined were Gordon, Pat Shrimpton, Nobby Clark (of the important briefcase with his bottle in it), Pat Shrimpton and David Bonnie Lindsay Stevens now of Bangor. I have worked with the guy front left but age is beginning to tell now. Bruce Oram at the school has all the old photos including those from Kidbrooke and most have the names on them. Well, that's it for this week. I am going to run an advertisement in the RAF News looking for information on both Changi and Kai Tak - but please don't let that stop you from looking in your old shoeboxes full of photographs!